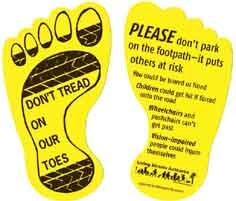 Join in our efforts to make sure footpaths are for pedestrians not for parking cars. You can order Yellow Feet by emailing accounts [at] livingstreets.org.nz. Councils and other organisations can order print runs with their logo included. Or find a sponsor and we can get them printed for you with your sponsor's name. Yellow Feet are available free to members and individuals at local meetings or we can send small numbers to members direct. Larger numbers by arrangement.